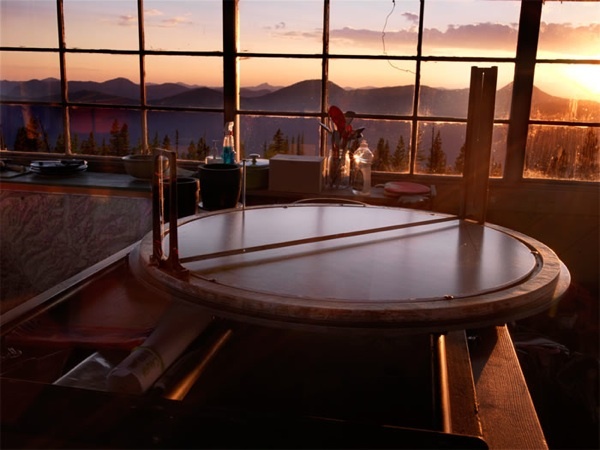 I've long had an interest in the old fire lookout towers in the Glacier Park area, and a year or so ago I exchanged some e-mails and calls with a Pittsburgh photographer named Tom Persinger, who was planning an expedition to Montana to photograph the lookouts. Tom followed through with his plan, visiting the North Fork country last summer and photographing three very remote lookouts. 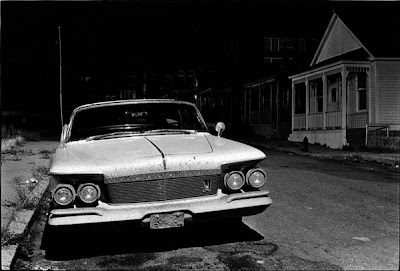 The results were both evocative and spectacular, and I wanted to post a link to his online gallery ... you can view a selection of his photos here. Tom gave me permission to repost a sample of his work here, and this is one of my favorites. The shot looks through the windows of the ancient Thoma lookout building, in the Flathead National Forest just a little south of the Canadian line. Last summer was the first that Thoma was staffed in a generation. The round device in the center of the photo is an "Osborne Firefinder," a device used to pinpoint the locations of fires spotted by the lookout. As much as probably any state, Montana has a long and illustrious dude ranch tradition ... tourists have been coming out here to experience the old west almost since the earliest cowboy days. By the 1920s, there were a number of well-established dude ranches in the state, and it was a profitable summer industry for Montana. This great old photo was shot in 1928, at a fairly amazing dude ranch called Samp Senia, in the Beartooth Mountains outside of Red Lodge. 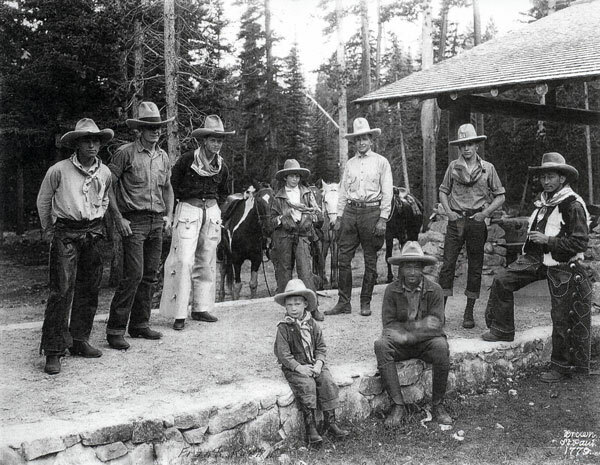 These were the camp's wranglers, the local guys who dressed up as cowboys and helped visiting easterners experience the Old West. They're an imposing bunch, indeed. The more time I spend on the internet, the more I realize that there's a site devoted to just about every obscure interest possible. A few days ago, for example, I discovered a website maintained by Columbia University, titled "The Biggert Collection of Architectural Vignettes on Commercial Stationery." Who would have thought? 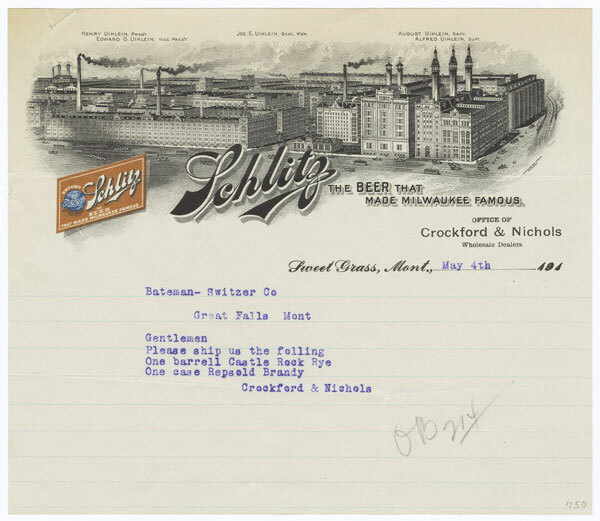 But it's fascinating stuff, not only for the letterhead graphics but for the contents of many of the letters. 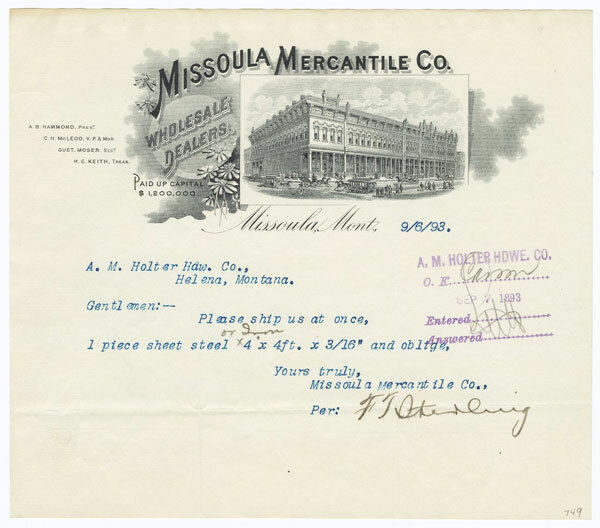 Here's a Montana example: an 1893 letter from the old Missoula Mercantile company to Holter Hardware in Helena, both well-known institutions in early Montana history. 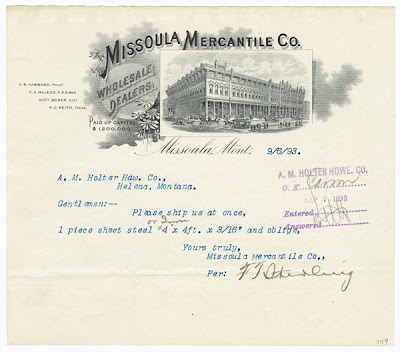 The Merc, of course, was a downtown Missoula landmark for years, even after the store was acquired by The Bon Marché and later Macy's. Today the old building is empty and awaiting a promised redevelopment ... good news, though it's too bad its days as a department store are over. Today's photo is a shot of the old Hell's Canyon Guard Station, up in the Highland Mountains west of Silver Star ... it's another one of the Forest Service recreational cabins I hung out at last summer. A really lovely spot, like so many in the state. I confess I have mixed feelings about the Highlands ... the geography is thoroughly inviting, but the mountains really suffer due to their proximity to Butte. Most of the local visitors to the Highlands clearly don't respect the land, and it shows. When I first meet out-of-state people and tell them that I'm from Montana, as often as not the response I get is something like, "Oh, that's where you can drive as fast as you want." 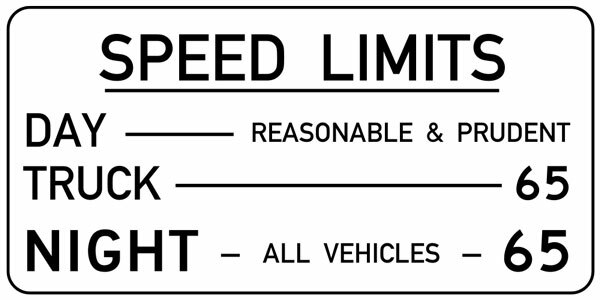 This despite the fact that our state's highways have had arbitrary speed limits for over a decade, now. Old stereotypes die hard. Sadly, my tenure in Montana doesn't go back quite far enough for me to remember those heady, pre-1974 days when our state's daytime speed limit was "reasonable and prudent," but I did get to enjoy the three years back in the late 1990s when that was again the case. 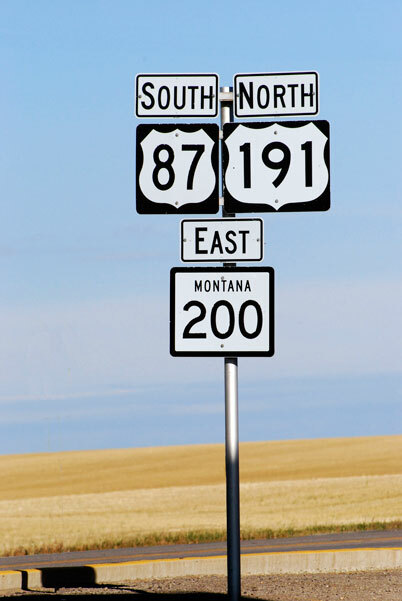 Those of us who drove in Montana back then will remember the sign below very well. A couple of years ago, I posted a photo of one of my favorite abandoned buildings in the state -- the old Rocky Valley Lutheran Church in the ghost town of Dooley, up in Sheridan County. 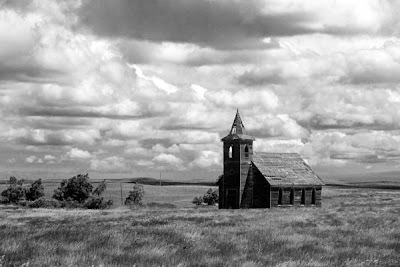 I took that shot way back in the early 1990s, and I've wondered for years if the old church still survived. I finally managed to get back up to Dooley last July ... and the church was still there, remarkably little-changed from a couple of decades before. Here's the photo I took in 2010. Nowadays, the park rangers in Glacier mostly spend the winter months holed up in a handful of the larger ranger stations, but back in the early days of the park many of them lived in the wilderness year-round, in primitive log cabins often completely inaccessible by road. It was a rugged and solitary life, especially in the winter. Kishenehn was one of the most remote of Glacier's backcountry ranger stations, just a few miles from the Canadian border along the North Fork. The park stationed a single ranger there, summer and winter, for nearly thirty years ... the only park employee for miles. The place has been mostly deserted for over seventy years, now, but the old buildings are still up there. This great old photo recorded the rarest of events at Kishenehn -- a party. The date is Thanksgiving, 1933, and all of Glacier's west-side rangers have gathered at Kishenehn to celebrate. 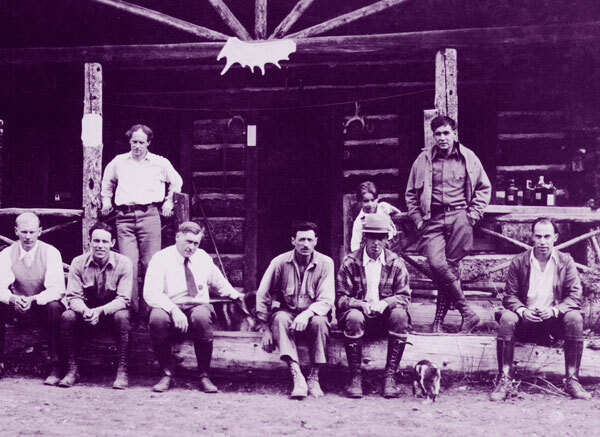 These are the men who protected Glacier park nearly eighty years ago. Nowadays, the Montana Department of Transportation is hardly known for its inspired signage ... when it installs a sign that's brilliant enough for a photograph, it's almost certainly accidental. This sign, up at Eddie's Corner in Fergus County, is a perfect example; I think it's the best highway sign in the state, though I'm pretty sure it wasn't intended to be. But as good as this sign is, it's just not quite perfect. 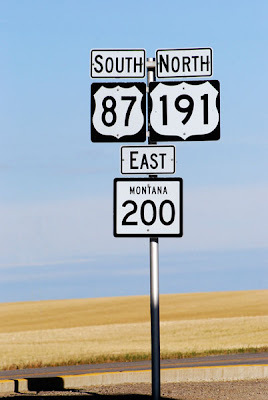 So I think the citizens of Montana need to march on the MDOT building in Helena, demanding that the state assign a fourth highway number to this stretch of road ... one that's heading westbound! I've seen a million photos of the Going-to-the-Sun Road over the years, but I found this one on the web recently and it immediately became one of my favorites. It's from a box of slides taken in June 1963 by an unknown family from Great Falls, on vacation in Glacier. They're heading up the east side of Logan Pass, and that's Going-to-the-Sun mountain in the background. 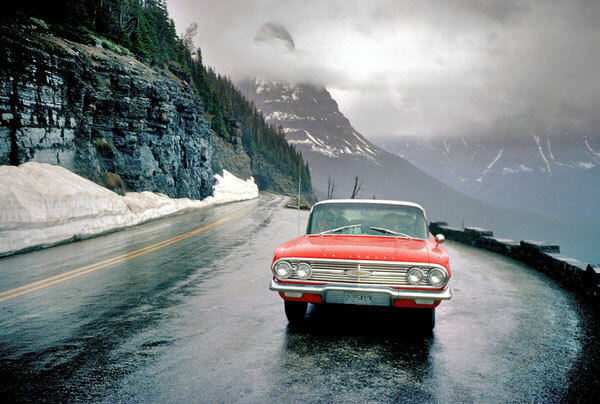 That old Chevrolet is just so wonderfully red. The cultural geography of the American West is unique in many ways ... and one of the most intriguing is our odd habit of building giant letters on local hillsides. It seems like nearly every little town in the Mountain Time Zone has a hilltop monogram nearby -- the towns that have the setting for it, at least. And with Montana's abundance of topography, they're nearly ubiquitous. Only the Hi-line, with its shortage of mountains, misses out on the fad. Most of the monograms commemorate both the town and the local high school ... usually, the school and its boosters build the letters and maintain them. 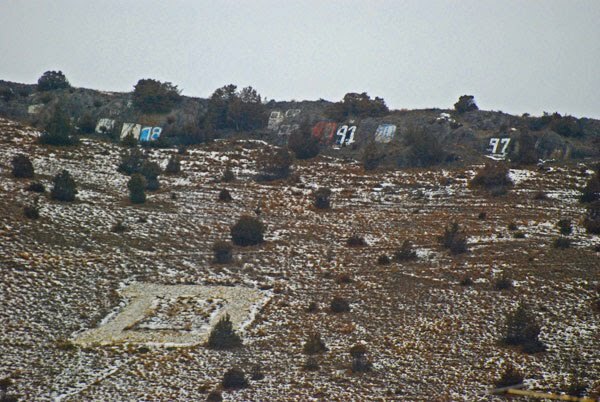 That connection is particularly obvious in a few places, where the graduating classes annually hike up to their letter and paint the class year on a nearby rock. The result over time is a sea of numbers -- a fascinating combination of graffiti and small-town ritual. I took this photo of Drummond's monogram yesterday, a grey winter morning with a January rain slowly melting the last of the snow. It always fascinates me, the things that people remember and the things people forget. It's particularly intriguing for travelers ... because often, the grand museums and spectacular natural wonders one visits take a back seat in memory to places that are far more obscure. A couple of decades ago, an out-of-state friend of mine took a long roadtrip across the American west, spending a fair amount of time in Montana. Whenever he mentions the trip to me, though, he doesn't talk about his days of hiking through Glacier ... instead, he tells me how very cool Oscar's Dreamland was. What was Oscar's Dreamland? Well, it was a tourist attraction out between Billings and Laurel, just south of the Interstate. The place was the creation of a retired gentleman named Oscar Cooke, who started collecting old farm tractors and then got carried away. Eventually he had several old buildings, hundreds of pieces of antique farm equipment, and countless other cool old things, and he displayed it all in an amazing, odd museum that he opened to the public every summer. Places like that seldom last, though. Oscar died back in 1995, and though his family initially promised to keep Dreamland going, they auctioned nearly all the stuff off three years later. So my friend's great memory will never be repeated. 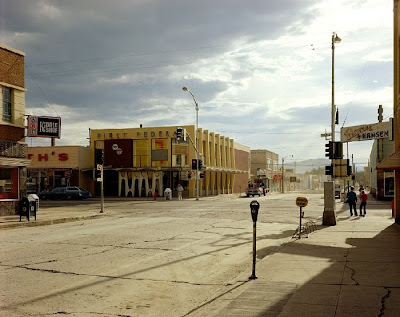 Here's an old postcard of Oscar's, probably from the late 1970s or so. Anyone who's explored Glacier Park knows that its east and west halves are very different places... the east side is higher and windier and with fewer trees, while the west side has deeper valleys and great forests and lakes. I much prefer the west side of the park, overall ... it feels far more like Montana to me, and its easier to get away from the mobs of tourists, too. I make an exception when it comes to Two Medicine, though ... it's my very favorite part of Glacier's east side. It's quiet, and the scenery and the hikes are lovely. 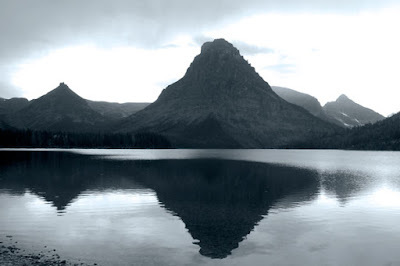 I took this view of Two Medicine Lake last fall, the same day I photographed East Glacier's purple spoon. For years now, I've been a member of a very fun organization called the Society for Commercial Archeology. 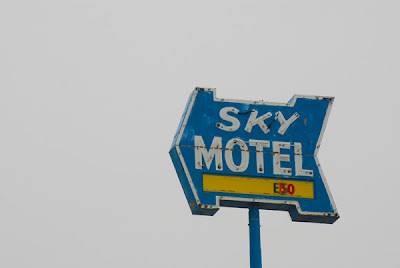 The SCA is devoted to the history of the American roadside ... things like old diners, drive-in theatres, neon signs, Mom-and-pop motels, souvenir stands, and so on. And always, the quirkier the better! I absolutely love stuff like that ... which is why I had to stop and take a photo while driving through East Glacier Park last October. 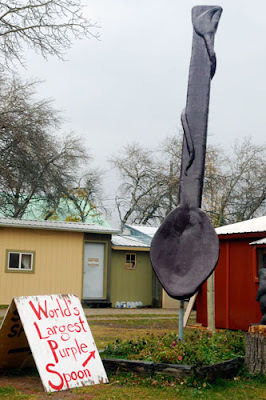 It's not every day you get to see the World's Largest Purple Spoon. I'm a big fan of historic signs, and here's one that I photographed last fall ... this is on the wall of the old Milwaukee Road depot in the town of Grassrange. 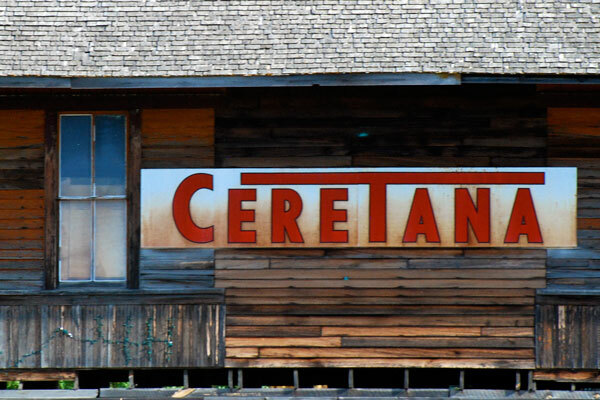 "Ceretana" was a trademark of the Montana Flour Mills Company, which advertised, "It Pays to Feed Ceretana Feeds." 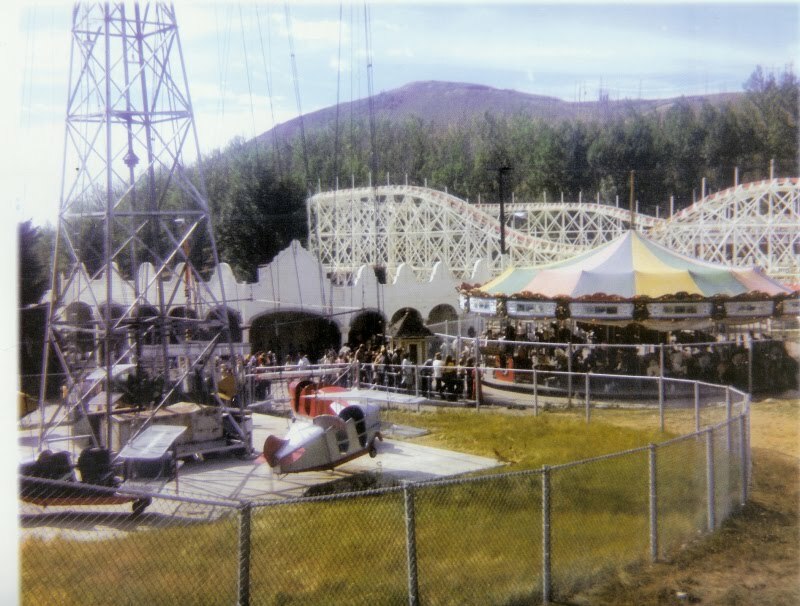 Here's a bit of trivia that most of you probably didn't know, unless you've lived in Butte: Montana was once home to a real, old-fashioned roller coaster! It was, of course, at the old Columbia Gardens amusement park outside of Butte. 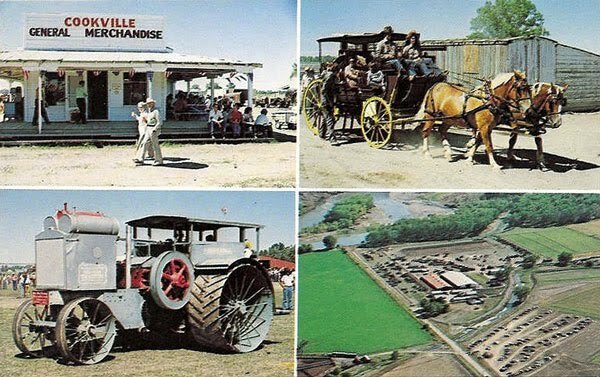 Established in the early years of the twentieth century by William A. Clark, the copper magnate, the Gardens was Butte's primary recreational venue for some seventy years; the author John Gunther called it a "threadbare little park," but it was all that Butte had. And threadbare or not, the roller coaster looks like it was pretty cool. Columbia Gardens was acquired by the Anaconda company in 1928, and they kept the place going until 1973. In typical Butte fashion, the park's grand old carousel was destroyed in a mysterious fire that year, while the roller coaster and nearly everything else was torn down. The town has wanted to build a new Columbia Gardens ever since, but (again, in typical Butte fashion) the plans haven't gone anywhere. Today, most of the old park site is beneath hundreds of feet of mine waste rock. There's no doubt that Montana has long had more than its share of intriguing personalities ... one of the great things about this state is the way it attracts free spirits. One of the state's freest spirits belonged to a singer and wilderness advocate named "Walkin' Jim" Stoltz, who passed away back in September at age 57. Walkin' Jim spent his winters working down at Big Sky, but the rest of the time he mostly spent ... walking. He reportedly hiked over 27,000 miles in his adult life, mostly in wilderness, crossing the length of the country in most every direction. He had a guitar along on some of those trips, and the folk songs he wrote led to a second career as a recording artist and concert-giver. 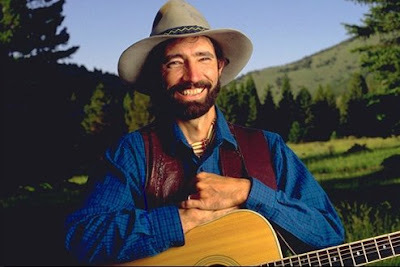 His website called him a "troubadour for the Earth," which is a pretty accurate description. A fascinating and memorable guy, indeed. Jim was also an artist and poet, and I thought I'd share one of his poems here. He penned these lines in 1995 to memorialize Edward Abbey, the famous and eccentric chronicler of wild country in the American southwest ... but the words are a fitting tribute to Walkin' Jim, as well. The canyon wind mourns good-bye. They piled up fast and spread with time. Seeing yesterday's Kalispell photo prompted me to post an image of another great mid-century Montana bank building -- this is a postcard view of the old Security Bank & Trust building in Bozeman, constructed in 1960. It was an outstanding example of an exceptional, but under-appreciated architectural era. 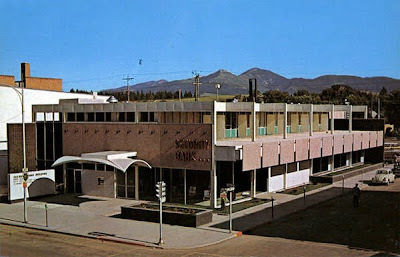 Unfortunately, this building is gone, too ... First Security Bank destroyed it a couple of years ago and replaced it with a facility that can only be described as awful, both architecturally and functionally. I've had my accounts there for nearly thirty years, and every time I interact with the new building I mourn for the old one, and want to withdraw every penny from its replacement. One of my holiday gifts this year was a book called Dow's Dictionary of Railway Quotations, a near-perfect present who's intrigued by trains, and who loves both quotes and travel. Unfortunately, the volume's compiler is English, so Britain receives undue attention and the railroads that helped build my part of the world are largely ignored. But so it goes. Most men who have really lived have had, in some shape, their great adventure. This railway is mine. I feel that a labor and a service so called into being, touching at so many points the lives of so many millions with its ability to serve the country, and its firmly established credit and reputation, will be the best evidence of its permanent value and that it no longer depends upon the life and labor of any single individual. There's little doubt, indeed, that Hill's great adventure touched the lives of millions, including many thousands of Montanans over the generations. 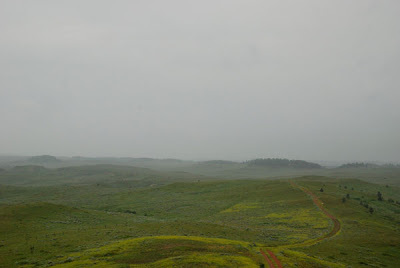 One last photo from the Diamond Butte country, a telephoto shot of the access road to the lookout. 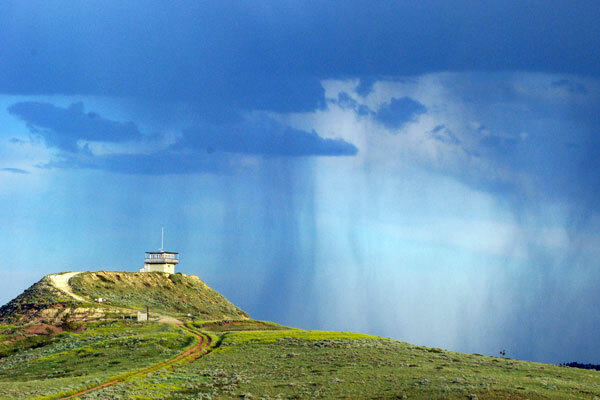 There's something really wonderful about watching a prairie rainstorm ... even when you're wondering what all that water will do to the sticky gumbo on the road that is your only way out. As a follow-up to yesterday's post, here's an interior photo of the old Diamond Butte lookout. A propane stove and lights, a couple of bunk beds, a little wooden table, an Osborne Firefinder ... and an endless, perfect view. There are lots of interesting hotels and B&Bs in Montana, but for my money the best places to stay out here are the ones you can reserve at recreation.gov. 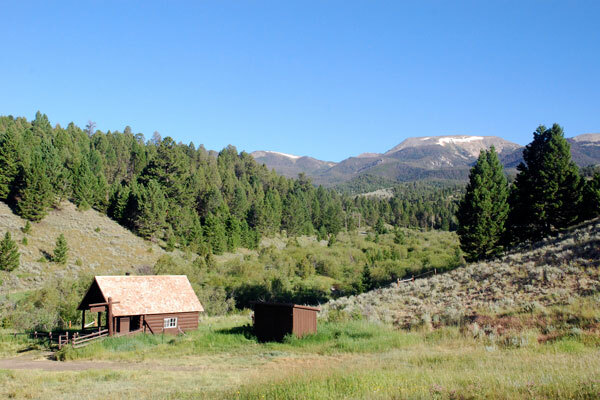 These lodgings are very different from your typical motel -- they're mostly old Forest Service cabins and fire lookouts, built decades ago for ranger patrols and now rented to adventurous travelers. Nearly all are extremely remote and quite rustic ... no electricity, running water, or paved roads at these places, just lots of solitude and spectacular views. And peace. I've rented a number of these cabins over the years, and they've all been idyllic places. Here's one of my very favorites: the old Diamond Butte Lookout, an hour or so south of Ashland in an almost-unvisited corner of the Custer National Forest. 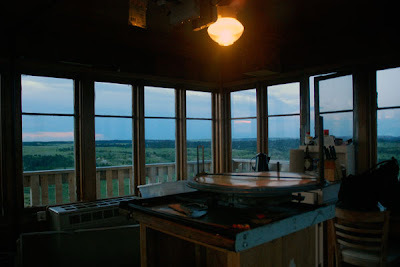 It's a thoroughly isolated spot, and I think the lookout only gets a handful of reservations a year, but staying there is a wonderful experience. I took this photo on a July evening last year as I arrived at the lookout, just after a summer thunderstorm had passed. It was a glorious evening, watching the sun set over the prairies and hours of nighttime lightning strikes off towards the Black Hills. I didn't see another soul, and it was if I had the world to myself. For the final part of my personal 2010 update, I wanted to introduce my new traveling companion: this is Charlie, the Australian Shepherd. I adopted Charlie from a shelter in October ... he's a very happy little guy, and he's already decided that he loves exploring with me. Hopefully the two of us will be wondering around Montana for years to come. 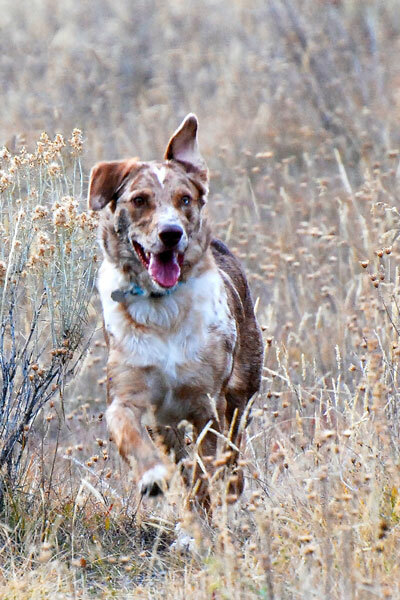 And if you need anyone to chase some cattle for you, be sure to give Charlie a call. I think it's time to return to Montana blogging, at least for a while. My apologies for the long absence ... it's been a very busy few months, with a number of changes, and I want to mention a couple of them in my first two posts. 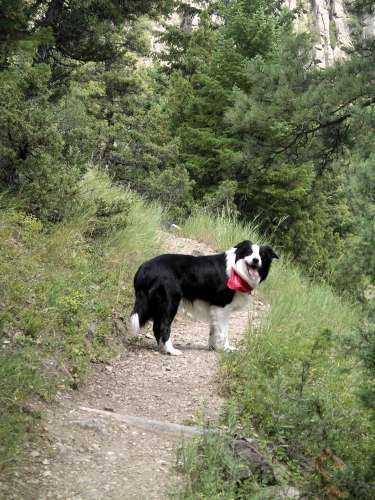 When you go exploring, the most important thing is to have good travel companion, and for nearly seven years I had the very best -- Miles, the Border Collie. Miles was along for nearly all of my Montana wandering, and he saw more of the state than nearly any human ever will. Always eager to go, always happy to be on the road with me. Miles died back in May, after battling a tumor for over two years ... an eager hiker and great companion till the very end. Rest well, my friend.